Alan Bent, the manager of Woodhall Spa Co-op, is seen presenting the cheque to Woodhall Spa Croquet Club members. Members of Woodhall Spa Croquet Club have received a cheque for £830. The money was raised by shoppers using their dividend cards at the town’s Co-op branch between December and March, when the club were the Community Champions for that quarter. The £830 will go towards erecting a low fence around the croquet lawns to prevent stray balls from hitting members of the public as they stroll along the paths near the lawns in Jubilee Park. The money will be especially welcome, as the club’s bid for a Lotto grant to erect a cabin-type club house and safety fence has recently been turned down. Chairman Bob Potter said: “It will be particularly difficult to raise the money ourselves, as we have other on-going maintenance expenses, but the members’ hopes had been raised that we would have our own clubhouse and fence by the end of this year, so we are going to pull out all the stops to try to make this happen. 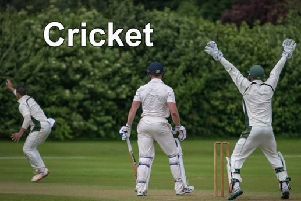 The croquet season is well under way and a taster day at the club is planned for June 4. Anyone interested in trying croquet, and possibly joining the club, can contact Pauline Donner on 01507 622741.